After a six and a half hour train ride, I was more than ready to be in Prague! 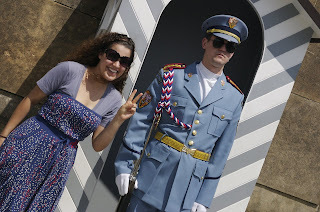 Also, after reading all I could about Prague, I was more than paranoid about the city! But, it turned out to be more than I expected. This city really is based on a crazy history of fighting for its freedom. We started out taking a walk through Wenceslas Square, where throughout history many rallies have happened; the most recent notable one being in 1989, when the end of communism was declared. We then continued winding our way through the city, stopping to see the astronomical clock do its thing (and see all the disciples make an appearance when the hour strikes), then for a walk over the Charles bridge. It was at the Charles bridge that I saw some paddle boats. Ian agreed to go on one with me. This was the biggest mistake of our lives! First, we got out on the river and there were huge boats in the area where the paddle boats are and this freaked me out. Then, it started to storm and was very windy and we had some trouble fighting the wind to get back in. I started freaking out and was ready to jump overboard, but luckily we were able to navigate our boat back to the dock and got off it as soon as possible! I don't think either Ian or I will be on another paddle boat for a long time! After the paddle boat incident, we decided to head back to our hotel for a break. Only, the weather had other plans for us. We got caught in a downpour. We ran for cover in a phone booth, but the rain was coming down sideways and still getting us, so we ran to a pub where we stayed until the worst part of the storm had passed. That night, we headed out to dinner at a New Orleans style restaurant with live blues music. 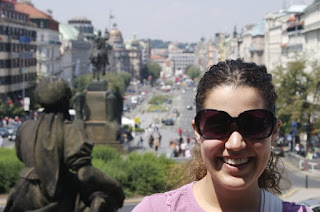 The next day, we got up and headed over to the palace in Prague (the largest in the world). It offered some beautiful views of the city. Then we headed over the the Miniature Museum...something that I wanted to hit up. Everything on display, you had to look at through magnifying glasses. My two favorites - camels in the eye of a needle (get it?) and the Lord's Prayer on a hair. Kind of crazy!?! After that, we hit up the Museum of Communism, which told the story of communism in the Czech Republic. We rounded off our 4th of July back at the same restaurant as the night before, where they were having a 4th of July celebration! It made me feel like I was back in the states ad not really far away from home. On our last day (really, a half day) in Prague, we headed over to a memorial/museum in honor of the men who assassinated Reinhard Heydrich, the guy Hitler put in charge of the Czech Republic. Then, we holed up for a while on the patio of a coffee shop. Now here I am, sitting in the Prague airport waiting to head home...and get back to my plants and laundry! What an amazing adventure. I am so glad you had such a wonderful time. It would not be so fun for me with a two-year-old tagging along. Enjoy being home...good luck with laundry. Haha, I love the paddle boat story. I can just see you ready to jump overboard. I love Prague. RJ didn't care for it much b/c I think that's b/c most of the time we were there we were cold - it was mid-November. I'm so bummed I missed the miniture museum - but we also did the communist museum and a really gruesome torture museum. Did you come home with a puppet?